A helmet that vibrates when the wearer is within 1.5m of heavy machinery, and an exoskeleton that helps workers carry heavy equipment. These were some examples of work-site innovations presented yesterday at the 20th Annual Safety Award Convention of the Land Transport Authority (LTA). The theme this year is safety through innovation and technology. 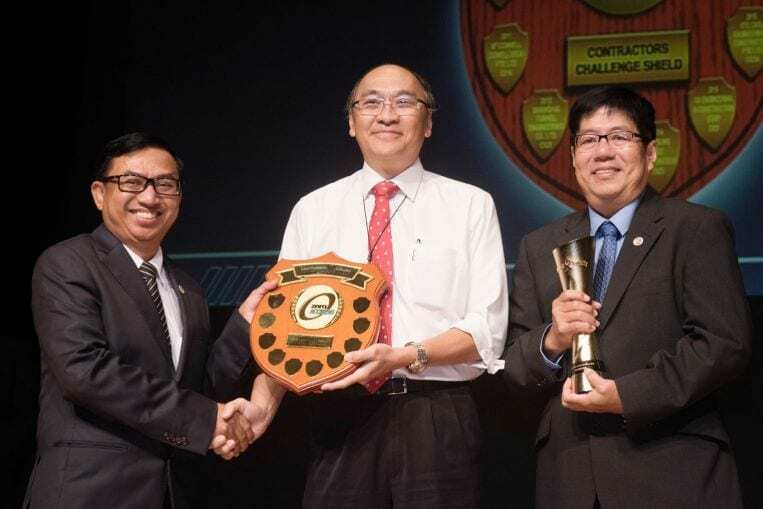 The top award, the LTA Contractors Challenge Shield, went to Shanghai Tunnel Engineering Co (Singapore) for its work on the construction of the Shenton Way station and tunnels for the Thomson-East Coast Line. The company said it has the only site-specific virtual reality (VR) training centre in Singapore, where a VR simulation was specially created for tunnelling work at the Shenton Way site. He added that about 150 workers have gone through the simulation and there are refresher sessions every six months. To encourage companies to leverage technology, LTA will also introduce the Construction Safety Innovation award at next year’s convention. This year’s convention also saw four new awards to recognise public transport operators for their efforts in promoting and ensuring workplace and commuter safety. SBS Transit won the excellence award for Safe Rail Line of the Year for the Downtown Line, with SMRT Trains bagging the merit award for the Circle Line. The excellence award for Safe Bus Operator of the Year went to SBS Transit for the Bedok bus package, while Go-Ahead won the merit award for the Loyang bus package. A bus package includes the suite of bus services run under the company. To be eligible for the rail award, the line must not have had any fatal rail accidents during the qualifying period from April last year to March this year, as well as pass the operating performance standards. The bus award requires the bus package to have fewer than 0.75 accident per 100,000 bus-km, and not have any bus accidents resulting in fatalities during the qualifying period. Thirty contractors and operators were recognised at this year’s convention.